Swizzles are sour style drinks with a similar composition to a punch that, distinctively, must be churned with a swizzle stick. They are usually served in a tall Collins or sling glass, and always with crushed rather than cubed ice. Due to originating from the Caribbean, swizzles tend to be rum-based but the name defines the mixing method rather than the ingredients. In his 1948 Fine Art of Mixing Drinks, David A. Embury handily defines the Swizzle, "the original Swizzle is, of course, made with Rum - Jamaica rum. Like any other drink of the Sour type, however, it can be made of any other liquor if desired. Liqueurs can, of course, be substituted for the sugar syrup. There are also some who like to swizzle aromatic-type drinks, such as whisky and vermouth. This is, in effect, a swizzled Manhattan. 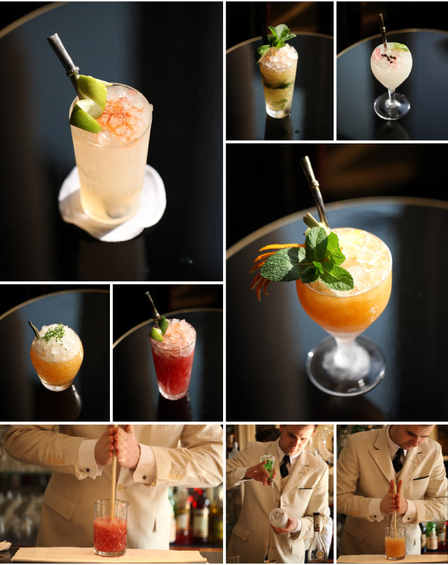 A few dashes of bitters will lend character to any Swizzle, either sour or aromatic." Swizzling as a means of mixing originates from a food preparation technique used in the West Indies, where foods such as batter would be mixed prior to cooking by spinning a stick with a paddle at the end, while moving it up and down within the container. The forerunner to swizzles was the Switchel, a non-alcoholic drink from the Caribbean comprising of water and vinegar with spice such as ginger, sweetened with honey or molasses. This became a popular drink served in the American Colonies during the late 17th century and by the 19th century it was commonplace for it to be served to workers at hay harvest time, thus it became known as the haymaker's punch. In his 1909 Beverages, Past and Present: An Historical Sketch of Their Production, Edward Randolph Emerson writes, "Swizzle is composed of six parts of water to one of rum and an aromatic flavouring, and while it may sound out of the ordinary, this beverage was often costly on account of the water in it, which on the island of St. Kitts, where the drink originated, was an expensive article, rum and sugar being often exchanged for it." Later, in 1920, Frederick Albion Ober, an American naturalist, wrote in his A Guide to the West Indies, Bermuda and Panama, "The great drink of the 'ice-houses' in Barbados and other islands is the 'swizzle,' which is a sort of native cocktail, made of the ordinary liqueurs mixed in a vessel with cracked ice and sugar, and then stirred to a froth by means of a 'swizzle-stick.' This stick is the stem of a native plant with radiating twigs". Originally a twig from a species of an evergreen tree, Quararibea turbinate, which grow in the southern islands of the Caribbean. Growing up to six metres tall these trees have forked branches, which make perfect swizzle sticks. Today swizzle sticks are also made of metal or plastic and have several blades or fingers attached to the base at right angles to the shaft, but genuine Quararibea turbinate swizzle sticks are still available. Swizzle sticks only work in drinks with crushed ice and Swizzles are generally mixed in the glass in which they are to be served. Preferably start with a chilled glass and make your crushed ice by pulverising dry cubed ice straight from a freezer (rather than wet cubed ice from an ice machine). Pour your ingredients into the glass and half-fill with crushed ice. 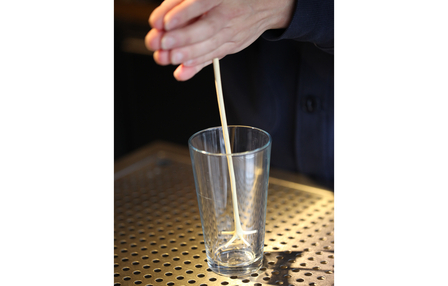 Immerse the blades of your swizzle stick, hold the shaft between the palms of both hands and rotate the stick rapidly by sliding your hands back and forth against it. If you do not have a bona fide swizzle stick, use a barspoon in the same manner. Top with more crushed ice and swizzle some more. The spinning motion of the swizzle stick mixes, aerates and dilutes the drink, and causes the outside of the glass to frost over. Swizzles can be served as short drinks or lengthened with mineral water. Your five-a-day fruits in a glass, laced with pungent rums and clove infused Falernum. Port wine is further fortified with golden rum and delicately spiced with Pimento Dram in this long swizzled punch. A swizzle for people like me - Chartreuse lovers. Best enjoyed on a hot summer's evening. Robustly flavoured ingredients brought together harmoniously in a tall, most refreshing swizzle. Worthy of its legendary status. Somewhat reminiscent of a frozen gimlet - the combination of gin and lime shines in this freshening swizzle.